The mystery of the Mansion involves a sobbing spirit. Locals tell the tale of a 7-year-old girl who died when she fell off the balcony into a creek below. Her ghost is said to appear around the anniversary of her death, crying and pointing up to the spot from which she fell. The story of the young girl actually happened at a hotel down the street. I’m a local and I’ve heard it many times. Could you please tell me a little more. 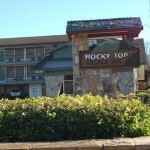 I was staying at a hotel/motel in Gatlinburg last week. I was not feeling very well so I stayed in bed watching tv. I was napping and when I woke up I thought I saw a little girl with a white cloak on. I told my husband about it last night and he told me to search and I founded you comment. Candace, Isaiah speaking here. Question for you.. May I ask you, whom and where did you hear of the story about the little girl falling from a hotel balcony? I happen to have a lot more of insider notes and facts on this incident. So, please feel free to E-mail me if you happen to be slightly interested. My email is all lowercase, isaiahcline32@gmail.com I look forward to your questions or comments. 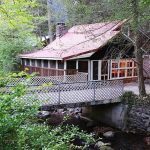 I have never been here before, but I have seen it on my vacations to Gatlinburg. I think I know what creek it is talking about. I have swam in it before. You do realise this isn’t even a real house and there is no outside balcony to fall from right? You need a better fact checker. Now I doubt any and all info on this site. It was down the street at a hotel from the mansion. Well, “apparently” you sir’, need to take the time to READ BETTER. I am actually the one whom posted this about the little girl. Me, Isaiah. I never once said that the little girl fell from a balcony at The Mysterious Mansion at all. Understand? You following me? I actually never said which building she fell off of at all. I always meant to say the little girl fell off of a balcony at The Edgewater Hotel exactly next door to The Mysterious Mansion. However, I unfortunately neglected to put place this in here, when I had put it into The ShadowLands.net website on Hauntings and Haunted Places in the United States. So, there it is in a nutshell. Now all of ye whom read about this little girl that fell from a balcony at a hotel, many of you will most likely not believe what I am about to say. My name is Isaiah. My family and I have been coming to Gatlinburg since I was a “pip-squeak”. While I was sitting in the library, during lunch break at McGavock High School, I was in the 10th grade. I happened across a website called THE SHADOWLANDS. It mentions every state in the U.S.A. and anyone is welcome to post their ghost stories,etc. Well, ah.. yeah, here we go.. I wrote about this “incident” while in the library in the upstairs section. Please note, I accidentally said that the “little girl” is said to “appear” TWO WEEKS before her death. I honestly still do not know to this day, why I said TWO WEEKS. That she can be seen “crying” and “pointing” to the balcony where she “supposedly” fell to her death. Please also note, that not one time did I mention the “date of her death” or the little girl’s name. The hotel that I was referring to, was directly next door to our LOVED..MYSTERIOUS MANSION. What really amazes myself, is all of the different people talking, and saying and telling stories regarding this incident and haunting!! 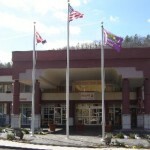 I swear to anyone, please look up the obituaries about Sevier County and Gatlinburg, and not one time will anyone find this death of our “little girl” falling from a balcony at The Edgewater Hotel. Again folks, I deeply and humbly do apologize for this. I have needed to say something LONG AGO before now. 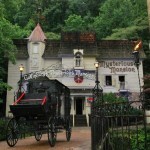 I ADORE Gatlinburg and especially THE MYSTERIOUS MANSION and it’s Employees and their family’s. I will be leaving my personal E-MAIL down below. So please, do not hesitate on sending me a e-mail, hating on me for this, or just asking me a question,etc. I look forward to yall’s remarks and opinions. Again, Thank You all for taking your time and reading my “coming of THE TRUTH” moment.